Reason for recall: Listeria. Click here for more details. Note: a similar recall was also issued in the United States. Click here for more details. Reason for recall: fall hazard Click here for more details. Note: there’s another Britax recall as well for its B-Ready Stroller and B-Ready Top Seats. Click here for more details. Reason for recall: fall hazard. Click here for more details. Reason for recall: potential glass in products Click here for more details. Reason for recall: choking hazard. Click here for more details. Reason for recall: laceration hazard. Click here for more details. DO YOU HAVE A COMPLAINT ABOUT A PRODUCT? Health Canada – how to report a consumer product. 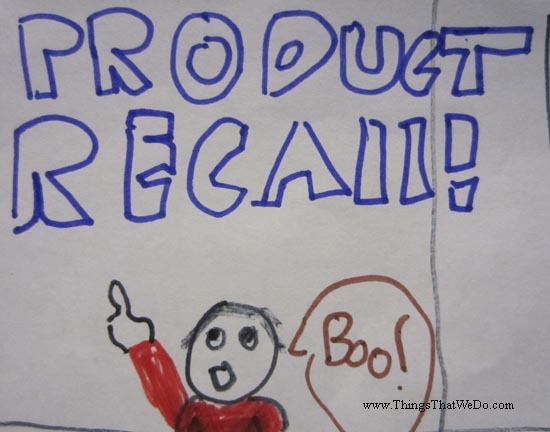 If you experience an incident with a consumer product, you need to know how to report it. Click here to read more. In the United States, if you have a complaint about a particular medicine, medical device, or food product, contact the FDA. Click here to read more. Stay tuned to ThingsThatWeDo.com. We’ll continue to keep you all posted of product recalls and safety tips! Let others know about these recalls: Tweet it!